Michael Eklund is a Canadian television and film actor who is known for playing the role of the villain or antihero. His characters are often described as being "creepy". Some of his roles include a kidnapper who terrorizes Halle Berry's character in the 2013 psychological thriller The Call, serial killer Barton Mathis in the second season of the superhero TV series Arrow, drug trafficker Zane Morgan in the second season of the psychological horror drama series Bates Motel (2014), Martin, the leader of a hedonist group called "The Rowdy 3" on the sci-fi TV series Dirk Gently’s Holistic Detective Agency (2016—2017) and demon Bobo Del Rey on the sci-fi TV series Wynonna Earp (2016—present). 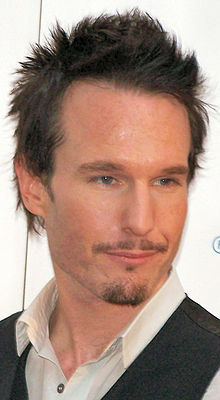 Eklund won the 2008 Leo Award for Best Performance in a Supporting Role for his work on the 2007 Canadian crime drama and thriller film Walk All Over Me. In 2012 Eklund won the Best Actor award at Fantastic Fest for his role as Dr. Geoff Burton in the psychological thriller Errors of the Human Body. He also won the 2013 Leo Award for Best Performance by a Male in a Feature Length Drama for the same role. In 2015 Eklund won the Best Actor award presented by the Union of British Columbia Performers and Alliance of Canadian Cinema, Television and Radio Artists (UBCPA/ACTRA) for his portrayal of English photographer Eadweard Muybridge in the biographical film Eadweard. Born in Saskatoon, Saskatchewan, Eklund fell in love with the movies at five years of age when his mother took him to see his first movie. He participated in school theatre then later decided to study painting at the Alberta College of Art in Calgary before dropping-out and moving to Vancouver, British Columbia in order to pursue an acting career. As an actor living in Vancouver (aka Hollywood North) Eklund has appeared on several Canadian and American television series filmed in the area. His first television role was in 2000 as a police officer in an episode of the sci-fi series Dark Angel. Eklund appeared on an episode of Stargate SG-1 in 2002, and appeared in 2 episodes of Battlestar Galactica the following year. In 2005 he appeared on the Canadian series Da Vinci's Inquest and Cold Squad. He also had a recurring role on the Canadian mini-series Terminal City that same year. Eklund appeared in 2 episodes of Smallville in different roles in 2001 and 2007. From 2005–2007 he played narcotics detective Rene Desjardins on the Canadian crime drama series Intelligence. In 2007 Eklund also had a recurring role on the Canadian series Blood Ties. In 2008 Eklund appeared on an episode of Supernatural. In 2009 and 2010 he appeared on episodes of the Canadian series Flashpoint . In 2010 he also appeared on episodes of the sci-fi series Caprica and Fringe. He also had a recurring role on the Canadian series Shattered that same year. In 2012 Eklund appeared in 2 episodes of the sci-fi thriller series Alcatraz. He also appeared in an episode of Arrow in 2013. In 2014 Eklund played Zane Morgan, a recurring character in the second season of the psychological horror drama Bates Motel. In 2015 he also played recurring character Robert Zorin on the Canadian sci-fi series Continuum. From 2016–2017 Eklund played Martin, the punk energy vampire on the series Dirk Gently's Holistic Detective Agency In 2018 he also appeared in 3 episodes of the sci-fi series Altered Carbon as Dimi 2, an illegal copy of character Dimitri Kadmin. In 2016 he also joined the cast of Wynonna Earp, a series filmed in Calgary, Alberta and surrounding rural areas. On the series Eklund plays Bobo Del Rey, a fur-coat wearing Revenant. In 2007 Eklund appeared in the Al Pacino thriller film 88 Minutes. In 2009, he had a small role in Terry Gilliam's The Imaginarium of Doctor Parnassus. He played Larry in the 2010 comedy-western film Gunless with Paul Gross That same year Eklund appeared in the British-Canadian comedy film The Making of Plus One, a film that also played at Cannes in 2009. In 2011 he starred alongside Michael Biehn in the Xavier Gens thriller The Divide He also played the character of Father in the apocalyptic siege warfare film The Day with Dominic Monaghan and Shawn Ashmore that same year. In 2013 Eklund played Michael Foster, a serial killer who kidnaps Abigail Breslin's character and terrorizes Halle Berry in the film The Call. Eklund has also collaborated three times with Calgary-based film director Robert Cuffley: In 2007, he played a crime boss’s enforcer in Cuffley’s dark comedy Walk All Over Me. In 2012, he played a desperate bartender in the violent thriller Ferocious and in 2016 he starred in Chokeslam as Luke Petrie, a friend of the film's protagonist. 2001 Smallville Will Episode: "Jitters"
2007 Psych Ruben Leonard Episode: "Cloudy... With a Chance of Murder"
2007 Smallville Richtor Maddox Episode: "Combat"
2009 Supernatural Ed Brewer Episode: "Monster Movie"
2010 Fringe Milo Episode: "The Plateau"
2018 Van Helsing Jacob Van Helsing Episode: "Crooked Steps"
^ a b c d e Wilson, A.R. (May 2, 2016). "Wynonna Earp's Michael Eklund on conjuring Bobo Del Rey". Digital Journal. Retrieved September 21, 2018. For an actor who has made a career out of playing intense characters, Michael Eklund is a pretty laid-back guy. ^ a b Ostergard, Jan (April 18, 2013). "Balance with Michael Eklund". MovieVine.com. Retrieved September 21, 2018. Michael Eklund is the reason people leave their porch light on. His brillian yet creepy portrayal as Michael Foster in The Call has resonated so deeply with audiences that people now look over their shoulder in parking lots. ^ Wheeler, Brad (November 17, 2017). "Review: Stegman is Dead is an unconvincing, clunky caper film". The Globe and Mail. Toronto, Ontario, Canada. Retrieved September 21, 2018. On the other hand, Michael Eklund is likable as an anti-hero burglar with a nagging wife and an adorable little daughter. ^ Duhatschek, Paula (October 14, 2015). "Telling the story of Eadweard Muybridge". The Ubyssey. University of British Columbia. Retrieved September 21, 2018. Epstein and Rideout’s interpretation of Muybridge is of a tortured genius — an anti-hero who would fit in alongside Walter White or Don Draper. In Eadweard, he is played with cryptic power by actor Michael Eklund, who was recently seen skulking around on the TV show Bates Motel. ^ a b "Michael Eklund biography". tribute.ca. Tribute Entertainment Media Group. Retrieved September 21, 2018. Many fans might recognize Michael Eklund as the creepy doorman from the Al Pacino movie 88 Minutes...Known for playing dark and edgy roles, Eklund is strongly and quickly becoming a household name in Canada. ^ Volmers, Eric (April 6, 2017). "How character actor Michael Eklund became Calgary filmmaker Robert Cuffley's go-to guy for creepy comic relief". Calgary Herald. Retrieved September 21, 2018. Since then [Eklund] has proven himself to be a versatile character, often cast as the heavy. That includes Michael Foster, a serial killer who terrorizes Halle Berry and Abigail Breslin in 2013’s The Call, chief demon BoBo Del Rey in the first season of the Calgary-shot sci-fi series Wynonna Earp and an uber-creepy store clerk in the 2015 end-of-the-world drama Into the Forest. ^ Travers, Peter (July 29, 2016). "'Into the Forest' Review: It's the End of the World (and They Don't Feel Fine)". Rolling Stone. Retrieved September 21, 2018. Stan (Michael Eklund), the creepy store manager, has sold them their last supplies. ^ "Michael Eklund biography". tribute.ca. Tribute Entertainment Media Group. Retrieved September 21, 2018. Many fans might recognize Michael Eklund as the creepy doorman from the Al Pacino movie 88 Minutes. ^ Moynihan, Rob (January 20, 2012). "Exclusive Preview: Alcatraz's Creepy Kidnapper". TV Guide. Retrieved September 21, 2018. ^ "2008 Leo Award Winners". LeoAwards.com. Retrieved September 21, 2018. ^ Cangialosi, Jason (September 29, 2012). "Fantastic Fest Review: 'Errors of the Human Body'". Yahoo! Voices. Archived from the original on November 9, 2013. Retrieved September 21, 2018. ^ Borders, Meredith (September 25, 2012). "The Fantastic Fest 2012 Awards! We're all winners here at Fantastic Fest 2012. But these guys more than most". FantasticFest.com. Retrieved September 21, 2018. ^ a b c d e f g h Leiren-Young, Mark (June 27, 2013). "Hollywood North: Michael Eklund pioneers a new look for Vancouver-shot feature Eadweard". Vancouver Sun. Vancouver, British Columbia, Canada. Retrieved September 21, 2018. ^ Gilbert, Rob (May 13, 2015). "Actor Michael Eklund portrays photographer Eadweard Muybridge in Eadweard, which has received 15 Leo Award nominations". Vancouver Sun. Vancouver, British Columbia, Canada. Retrieved September 21, 2018. ^ Marchand, Francois (November 9, 2015). "HMichael Eklund and Camille Sullivan win best acting honours". Vancouver Sun. Vancouver, British Columbia, Canada. Retrieved September 21, 2018. ^ a b c d e Volmers, Eric (April 6, 2017). "How character actor Michael Eklund became Calgary filmmaker Robert Cuffley's go-to guy for creepy comic relief". Calgary Herald. Retrieved September 21, 2018. ^ "Michael Eklund biography". tribute.ca. Tribute Entertainment Media Group. Retrieved September 21, 2018. ^ a b c d e f g h i "Bates Motel Cast: Zane Morgan Played by Michael Eklund". aetv.com. A&E. Retrieved September 21, 2018. ^ Abrams, Natalie (January 4, 2012). "Exclusive: Eric Johnson, Michael Eklund Head to Alcatraz". TV Guide. Retrieved September 21, 2018. Wikimedia Commons has media related to Michael Eklund.